Home Read Old Is New Again In M.A.V. Old Is New Again In M.A.V. I have to admit something; I was a bit of a nerd in my school years. I know, I know, it’s pretty difficult to believe when you see me now, but it’s true. There were two things that contributed to my childhood nerdom; computers and BattleTech. The computers angle isn’t anything too special; I loved games, BBS’s, the internet, and IRC. However, for as much as I enjoyed my 12 MHz 286, the love I had for it couldn’t begin to approach what I felt for BattleTech. I had all of the books, literally every single novel and sourcebook. I could, and frequently did, speak for hours about the history and political going-ons of all the Successor States. I spent every penny I had buying and painting figurines. All my free time at school was spent negotiating, backstabbing, and campaigning with other players to set up alliances and deals in anticipation of that weekends battle. It wasn’t just a game I played from ’86 – ‘97, it was who I was. Out of all the aspects I enjoyed in BattleTech, the one that trumped all others was designing Mechs. It was art, strategy, resource management, and fantasy roled into a single bubble filled piece of paper. And as much fun as the various BattleTech games were, especially 3025 Online, the MUSE’s, and the original Mercenaries, there was something missing from them; really great mech customization. Sure, you could customize your mechs a number of different ways in almost all of the BattleTech games, but you never felt like a creator. 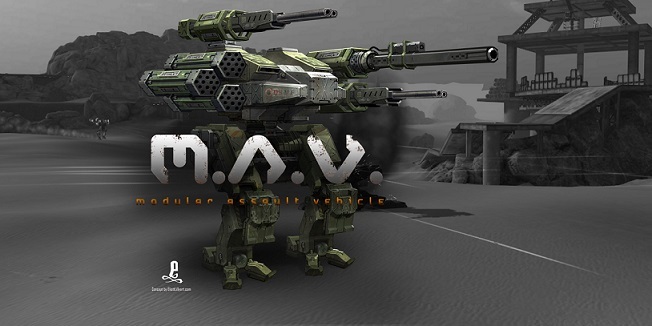 Enter Modular Assault Vehicle, or M.A.V., from Bombdog Studios. While not a proper MechWarrior game, M.A.V. obviously takes inspiration from the series, even if it’s a bit indirectly via Chrome Hounds and Robot Jox(?!). M.A.V. features an extensive back-story full of disagreements and war, all good stuff you can read up on over on the games’ Kickstarter page. The big selling point of M.A.V. though is the mech customization. Want more guns, missles, ammo, and fire suppression? Go for it! Want a customized paint job that allows your enemies to recognize you on the field of combat? Do it! 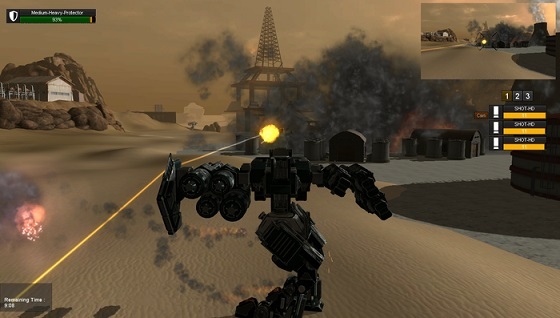 It’s the closest thing to a Kerbal Space Program mech game we’ve ever had. In the mean time, check out M.A.V. – Modular Assault Vehicle on Kickstarter and consider backing before the March 5th deadline.